Malaysia is not in the list. An applicant from Malaysia can nominate Europe, Australia or Korea to conduct the PCT search. The search fee, as in Dec 08, on MyIPO website is RM9065 for Europe, RM5153 for Australia and RM869 for Korea. Until today, a natural person from Malaysia qualifies for the 75% fee reduction by nominating Europe to conduct the search. From 1 January 2009 onwards, a natural person from Malaysia no longer enjoys the 75% fee reduction. The European search report is favored by some applicants because a clear report can hasten patent application and enjoys fee reduction in national phase application. The Interbrand valuation for Malaysia's most valuable brand is out. Banks lead the pack with the top three spot with Maybank RM9.3 billion, Public Bank RM6.8 billion and CIMB RM6.2 billion. Hong Leong bank is rated at the tenth spot with RM2.9 billion. Gaming giant Genting is fourth with RM4.4 billion. Parkson, with foreign retail business in China, is a new entry at number five with RM4.2 billion. Telecommunications institution, Celcom is valued at number six with RM3.9 billion and Digi is valued at number nine with RM3.0 billion. Astro is valued at number seven at RM3.4 billion and Petronas is valued at number eight at RM3.0 billion. Maxis has cease to be a public company and not included in the valuation. Having been in the sports and casual wear retail industry for three decades, the Cheetah brand has seen steady growth, especially as the number of shopping malls in Malaysia increases. The company is now shifting up a gear. The family business was founded by Chia Yoon Yuen, his wife Hor Ah Kuan and their son Kee Yew, in 1977. They initially operated out of their single-storey house in Kuala Lumpur with three staff. As the business grew, they moved to a double-storey house, then a shoplot in Taman Maluri in Cheras. Today, Cheetah is listed on the Bursa Malaysia main board and operates out of a 16,000 sq ft factory in Taman Shamelin Perkasa. It has six home-grown brands: Cheetah, Cheetah Ladies, Cheetah Junior, Cth Unlimited, C-two and C. Union. It is also the sole distributor for Ladybird children’s wear and GQ men’s office wear. Chia was roped in to assist his mother in 1979, after his father passed away. He was only 17. He and his elder brother quickly discovered that it was easier for a product with an easy-to-recognise brand name to get repeat purchases. They then decided on Cheetah as their brand name, and the rest, as they say, is history. An input audio data stream comprising speech is processed by an automatic censoring filter in either a real-time mode, or a batch mode, producing censored speech that has been altered so that undesired words or phrases are either unintelligible or inaudible. The automatic censoring filter employs a lattice comprising either phonemes and/or words derived from phonemes for comparison against corresponding phonemes or words included in undesired speech data. If the probability that a phoneme or word in the input audio data stream matches a corresponding phoneme or word in the undesired speech data is greater than a probability threshold, the input audio data stream is altered so that the undesired word or a phrase comprising a plurality of such words is unintelligible or inaudible. 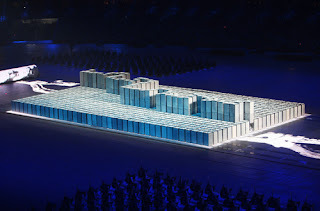 The censored speech can either be stored or made available to an audience in real-time. After 10 years in the international market as an original equipment manufacturer, Lewre International established the Lewre brand in 1997. Currently, the company has over 100 outlets in Taiwan, Singapore, Thailand, Australia, New Zealand, the Philippines, Brunei, United Arab Emirates and Indonesia. The company has been spending a lot of time and capital in brand building and today it is reaping the harvest. “Our target markets are middle to higher-end customers and our core competency is our niche design and good quality,” Lew said. He said the company worked closely with global designers in the US, Japan, Italy, Spain as well as locally to ensure Lewre’s position as a global brand. “We (also) want to focus more on producing fashion accessories and handbags in future to vary our product offerings instead of only footwear,” Lew said. The key objective of branding was to create a relationship of trust, he said, explaining why customers were loyal to a particular brand. “Branding is important in any industry, especially when you are facing bad times,” he said. Lew, who is also the president of the Branding Association of Malaysia (BAM), advised market players to be clear on their position before creating a brand. The brand building process also needed to be supported by product designs, images, marketing and customer services, he added. Lew observed that some local market players lacked confidence in their own ability. The General Assembly of the World Intellectual Property Organization (WIPO) appointed by acclamation on September 22, 2008, Mr. Francis Gurry, a national of Australia, as Director General of WIPO for a six-year term that begins on October 1, 2008 and runs through September 2014. In his acceptance speech, Mr. Gurry addressed the challenge of finding an effective response to the growing demand for patent services around the world, as well as the need to examine the future of copyright in a rapidly evolving business and technological environment. He also identified the challenge of promoting respect for intellectual property rights in the face of widespread trade in counterfeit and pirated goods and WIPO’s role in this endeavor. Mr. Gurry committed to build on the work of the Development Agenda, to ensure all countries were in a position to actively participate in the benefits of innovation and the knowledge economy. The Director General-elect further called for “concrete outcomes” to negotiations relating to the protection of traditional knowledge and traditional cultural expressions. Mr. Gurry is the fourth Director General of WIPO following Mr. Georg Bodenhausen of the Netherlands (1970-1973) Mr. Arpad Bogsch of the United States (1973-1997) and Dr. Kamil Idris of Sudan (1997-2008). THE popularity of MUNCHY’S has seen the Malaysian snack being munched in more than 50 countries around the world. The business, run by five brothers, started with just a wafer stick machine in 1991. Tan and his brothers have gone through tough times in bringing up the brand, especially in 1996 when the local market was saturated with many other big brands. “It took us about 10 years to grow Munchy’s into one of the top brands in Malaysia. Now our mission and vision in the next 10 years is to grow Munchy’s into a world brand,” Tan said. Tan, who foresaw the importance of branding after he joined the company in 1994, started a re-branding exercise in 2002. The company promptly brought in top branding consultants, who re-designed the logo with the distinctive colours of Munchy’s red and white. “Munchy’s brand value is to bring fun into people’s lives and this has been our main focus for the past six years. Munchy’s is a very catchy name. It comes from the word munch. Our brand is very lively as you can see from our product packaging,” Tan said. He added that a lot of innovation went into the design and packaging of Munchy’s products. “I believe everything starts from the product. You have to have a very good product and ...we put a lot of innovative ideas into designing the products from the packaging to brand image, the shape and weight of the products, basically from all aspects,” he said. The Tan brothers believe in continuous product development. Our trademark act aims to protect trademark owners from competitors who use a similar mark. What is a similar mark? Allow me to give an example of a recent case between Starbucks and Shanghai Xingbake Cafe. Starbucks is a well known coffee brand. The Starbucks trademark was registered in China in 1996. Starbucks operated in Beijing, China since 1999. Xingbake operated in Shanghai since 2000. The word 'Xing' means 'star' in Chinese and 'bake' is verbally similar to bucks. The logo for Xingbake shares the same green as Starbucks. Starbucks sued Xingbake for using a similar mark and imitating the design of its cafe. A Shanghai court fined Shanghai Xingbake Cafe, 500,000 yuan, and has ordered it to change its name because it’s too similar to Starbucks. Astro All Asia Networks Plc will not renew its trademark licence agreement, which expired on Aug 31, with Lippo group’s PT Direct Vision (PTDV), an Indonesian pay-TV provider, after a long and publicised tussle. In a statement to Bursa Malaysia yesterday, Astro said it had decided to withdraw all support and services provided to Lippo, including the use of the “Astro Nusantara” brand. The termination notice was issued after Lippo failed to settle the outstanding invoices amounting to RM805mil for Astro’s support and services. It had required Lippo to make the full payment by Sept 1, failing which Astro had the right to terminate the agreement. However, out of good faith, Astro has granted further extension of the trademark licence agreement to Sept 30 to enable PTDV to make alternative arrangements to minimise the impact on its customers. Astro has been funding PTDV RM20mil a month to run its services. It confirmed that all expenses incurred in PTDV had been accounted for and it expected to write down an additional RM200mil if it broke ties with Lippo. Astro is committed to retain its position as a supplier of TV channels, channel content and broadcast services to the pay-TV sector in Indonesia. Three years ago, Astro and Lippo entered into an agreement to become joint-venture partners with 51% and 49% share respectively. Although subsequently the Indonesia Government changed broadcasting rules which limited foreign equity participation to 20%, PTDV had received approval to operate under its existing licence and approvals while the application for new broadcasting licence was being processed. This scenario led to Astro allowing PTDV to use the “Astro Nusantara” brand name. Based on their earlier principle term agreement, Astro believed that any outstanding details would be discussed in good faith and the revised joint-venture agreement that complied with new regulation could be reached. Nevertheless, Lippo continued to delay and did not take any relevant action to conclude the joint venture. In addition, it had suggested an unacceptable takeover of its interest by a third party, which triggered Astro to withdraw its commitment with Lippo. As at April 30, Astro had invested RM536mil with Lippo. Meanwhile, Lippo had not contributed any capital in this venture and Astro had solely supported the funding. Currently, PTDV’s pay-TV business has over 100,000 subscribers. I have a habit of collecting brochures from education fairs so that I can choose the best university to attend. Foreign universities are good at it but only one Malaysian university stand out, USM. There were pictures and detailed explanation of courses and student life in the campus. I made USM as my top and second choice and I got my first choice granted, applied physics in USM. When I finished my undergraduate, I look around for any viable postgraduate course. I'm fortunate to be offered a scholarship by USM to pursue a masters degree in physics via research. The postgraduate education instilled a 'search for technical issue' foundation which I value much when I prepare patent applications for inventors. Thank you USM. Congratulations to my alma matter for being awarded the apex university status. Universiti Sains Malaysia (USM) was yesterday chosen for the Accelerated Programme for Excellence (Apex), beating three other universities, including the country's oldest, the University of Malaya (UM). Higher Education Minister Datuk Seri Mohamed Khaled Nordin told a press conference that USM was selected based on the university's transformation plan and its preparedness to make changes to its proposal paper. "The selection for the Apex programme is not only based on past achievements and excellence, but more on the planning for the future and whether the university is able to achieve a world-class status within the stipulated period of five years," he said when announcing USM's selection for the programme. During the five-year period, USM must be able to put itself in the Times Higher Education Supplement (THES) list of world's Top 100 universities and among the Top 50 by 2020, he said. He was confident that USM would be able to achieve world-class standard. "Let's see how USM fares and then we will decide whether to choose another for the programme," he added. Mohamed Khaled said USM's selection for the programme did not mean that other universities were sidelined. On the other hand, this should spur them to further improve their position, he said when asked why UM was not selected. Nine public universities nationwide had submitted their application for the programme but only four -- USM, UM, Universiti Putra Malaysia and Universiti Kebangsaan Malaysia -- were shortlisted. The results of one of Malaysia’s five research work conducted at the International Space Station has been patented by other countries, which proves the country can make a significant contribution to the world in science and research. Science, Technology and Innovation Minister Datuk Dr Maximus Ongkili said the results of protein crystallisation, a research headed by Prof Dr Raja Noor Zaliha Raja Abd Rahman of Universiti Putra Malaysia, have been patented not only by Malaysia but also in Europe, the United States and Japan. “The findings on protein crystallisation are of industrial importance and we expect a lot of companies, including those dealing in pharmaceutical, food supplement and oleo-chemical, to benefit from this. “This is certainly a milestone for Malaysia and it quashes the perception that Datuk Dr Sheikh Muszaphar Shukor was a space tourist,” Dr Ongkili told reporters yesterday after opening a workshop on micro-gravity sciences. "Malaysia needs a ratio of at least 60 researchers, scientists and engineers to every 100,000 people to achieve Vision 2020," said Higher Education Department director-general Prof Datuk Dr Ir Radin Umar Radin Sohadi. He said the current ratio is 17 to 100,000 people as compared to Singapore that has 87 and United Kingdom with 76. “At only 17, we simply don't have the numbers. The research field in the country is a rather 'vague' field. Other developed countries practice an industrial-based research and development field. “Students who are studying overseas need to come back and serve the country to reach the critical mass of such experts,” he said. Gunpowder, which is prominently associated with fireworks display. 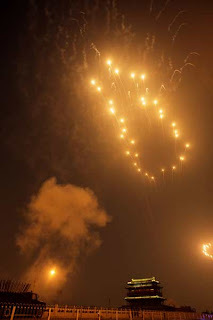 Fireworks were arranged to display foot steps entering bird nest stadium. Paper, as the greatest medium for art and literature. 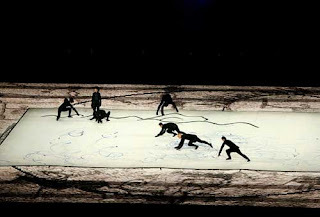 Dancers were moving around a giant paper scroll mimicking strokes of ink brush. Compass, which contributes to navigation. 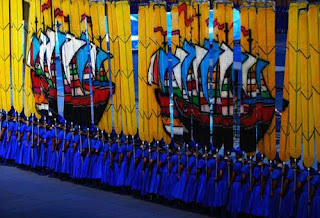 Oars bearing images of sea exploration by admiral Zheng He (also known as Cheng Ho) is shown. sectors: computer technology (144,594), telecommunications (116,770), and electrical machinery (121,350) technologies. Between 2001 and 2005, patent filings in computer technology, optics, and semiconductors grew by 5.3%, 5.0% and 4.9%, a year, respectively. There was a modest increase in pharmaceuticals filings (1.7%) and a decrease in biotechnology filings (-2.7%). (thermal and photo) energy, fuel cells and wind energy. Applicants from Japan accounted for the largest number of applications in the fields of solar energy and fuel cells. Whereas, Germany and Japan were the top two countries of origin for wind energy technologies. Henry Goh, one of the top IP specialist in Malaysia, passed away on 20th July 2008, at the age of 67. With some experience as a legal clerk in trademark affairs, Goh started Henry Goh & Co Sdn Bhd in 1977 due to a chance encounter with an Italian patent attorney. The encounter led him to be curious about this field which led him to discover the viability of this field from IP books and magazine. In an interview with Malaysian Business, Goh described his early trailblazing adventure as a test of resilience, self confidence and self ability. He personally attended to most of the paper work and deadlines as he did not have a dispatch staff then. As a pioneer who established an IP boutique firm, his networking and marketing flair contributes to his firms growth. Henry Goh is regarded as one of the top IP firms in Malaysia today. Goh regularly shares his knowledge by conducting seminars and presentations in universities, research organizations, chambers of commerce and business conferences. The IP profession in Malaysia has loss one of its prominent leader. David Ho's research on palm oil based ingredients resulted in an extracting process which he then patent. Then he set up Carotech Berhad in 1992 and the company was listed in Mesdaq on 2005 to capitalize on palm oil based phytonutrients. The manufacturing of phytonutrients was made utilizing specialized high vacuum low temperature distilation technology. In an interview with the Star, David mentioned that Europe is its biggest market which accounts for 70% of sales which is backed by Europe's ambition for using biodiesel. "Carotech has the technology that is not easily replicated by its rivals due to high level of research and development. It also enjoys its “early bird” status in the industry as barriers to entry to the phytonutrients and biodiesel industries are relatively high." 3. Provision for invention to have technical contribution. A computer implemented invention must contribute a technical effect. Country: Most of the countries in Europe. Malaysia and China, not in the survey, also falls in this group. WIPO announced a good news for individual inventors. As of 1 July 2008, WIPO is giving a 90% discount for individual inventors who opt to file PCT. The 90% discount is valid for international filing fee. The search fee for EPO is reduced by 75%. This discount is valid in countries with national capita income of less than USD3000. Technologies that are developed at national applied research company Mimos will be turned into commercial products and applications by local companies. Close to a dozen companies have licensed key technology platforms from Mimos, the company said. Datuk Abdul Wahab Abdullah , Mimos president and chief executive officer, said the purpose of the licensing programme was to transfer the technologies from Mimos’ laboratories to local companies. “The technology transfer process is critical for the country as the private sector joins the government to commercialise homegrown technologies,” Abdul Wahab said. The applications licensed by Mimos are mostly semantic technologies — namely web portal, logistics, travel and medical applications, which were licensed to Alam Teknokrat Sdn Bhd, Biforst Technology Sdn Bhd, Bill Adam Associates Bhd and In-Fusion Solutions Sdn Bhd respectively. Semantic technologies enable more interactivity in processing information. 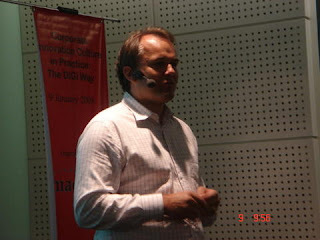 These semantic applications will provide a platform for computer applications to be meaning- and knowledge-based, Mimos said. Besides semantic technologies, Mimos has licensed other technologies such as a hybrid solution that combines WiFi, WiMAX and Internet Protocol Version 6 (IPv6) technologies to Pernec Integrated Network Systems Sdn Bhd. Additionally a grid computing solution was licensed to Jaring Communications Sdn Bhd. Mimos said it also licensed iDola (a PC-based mobile computing device for the education sector) to FTEC System Sdn Bhd, while Jen-ii (a PC-based computing device to bridge the digital divide) was awarded to Mimos Smart Computing Sdn Bhd. The Science Technology and Innovation Ministry (Mosti) is in the midst of finalising other technology recipients, identified by Mimos, for the transfer of more Mimos technology platforms. However, Mimos declined to comment on the current technologies it is working on. The 11 technology recipients were identified by Mosti. These companies only need to pay royalties to Mimos for the technologies, according to Abdul Wahab. He did not specify the exact amount. In Malaysia, a lesser extent invention can qualify as a utility innovation. Utility innovation has lesser requirements compared to a patent which needs to involve an inventive step. A utility innovation can be applied as long as it is new and industrially applicable. The utility innovation will be subjected to a substantive examination as a patent application. There is no standard provision by WIPO for utility innovation. Japan, Korea, China and Europe have a silmilar protection called utility model. Each of these territories have developed their unique protection for utility model. Terms of protection of six to fifteen years can be obatained according to the statutes of these territories. Now, each of these territories adopt a non-substantive examination principle. The non-substantive examination principle allows the inventor to quickly look for investors and launch their product in the market. With a utility model, the applicant can enforce his right quicker than a typical patent application routine. US and UK have no provisions for utility model. Europe is formulating a standard utility model. Shall Malaysia follow suite? Shall Malaysia join Madrid Protocol? On May 27, I attended a seminar on Madrid Protocol organized by MyIPO and WIPO. WIPO was kind to send Alan Datri of WIPO, Federico Guicciardidni of WIPO, Jonathan Clegg of FJ CLeveland (UK) and Louis Chan of IPOS (Singapore) to enlighten us on the benefits of joining Madrid Protocol. Filing trademark in multiple countries involves multiple procedures, multiple languages, multiple currencies and multiple renewal operation. Madrid protocol is a system of filing trademark registration in multiple countries. It provides a single procedure, single language, single currency and single renewal operation. It provides cost savings to trademark owner who intends to file trademark in multiple countries. However, Malaysia is not a member of Madrid Protocol. The event was officiated by the Director General of MyIPO. By joining Madrid protocol, he mentioned that emphasis will be given to national interest to allow our home grown brand to have easy access into the world market. A client of mine is interested in the Gulf Country Council (GCC). GCC is a trade bloc involving six Arab states of the Persian Gulf with many economic and social objectives. The six Arab states are Bahrain, Kuwait, Oman, Qatar, Saudi Arabia and the United Arab Emirates. The GCC formed a GCC Patent Office in Riyadh, Saudi Arabia. The GCC patent office provides patent protection in the six states concerned without national phase application. The GCC Patent Regulations provide that an invention is patentable if it is (i) new, (ii) involves an innovative development that is industrially applicable, and (iii) does not violate the rules of Islamic law, public morality or public order as applied in the GCC member states. There is a provision that a patent owner is required to use the patented invention in the GCC within three years after the patent is granted. Otherwise, a compulsory license may be granted to a third party who is interested to exploit the patent in the GCC. The official language of GCC is Arabic. Hence, the patent needs to be translated into Arabic. MyIPO's new director-general, Kamel Mohamad, says MyIPO has been working together with other ministries like the Ministry of International Trade and Industry and the Ministry of Science, Technology and Innovation to find ways in which it can contribute. "MyIPO wants to strive for excellence as an organisation and we are here to promote and protect Malaysia's interest in the area of intellectual property. One of the areas for us to focus on is the partnership that we have with other government bodies. Under the NIPP; the various parties will meet when there is something to discuss. There is an inter-ministry planning group that gets together to share information on what each government body is doing. We are now talking with partners in the areas of ICT and bio-tech. Our original mandate is just to administer the IP process, but I think we need to playa part in facilitating it," he explains. Kamel adds that a recent statement released by the World Intellectual Property Organisation (WIPO) indicates that there has been a shift in terms of patent growth to Asia. China, South Korea and Japan had made it to the list of top 10 countries with the highest number of patent filings, while Northeast Asian countries recorded notable growth for the fourth consecutive year. In 2007, patent filings from these countries accounted for 25.8% of all international applications. South Korea and China both overtook France and the Netherlands for the fourth and seventh spots on the top 10 list respectively. "Last year, there was a fivefold growth in patents filed in India. As for Malaysia, since we signed the PCT, there has been about 70 % growth in the number of patents that go through international filing - from 60 to 103. To cater for the increase in patent filings, we hired 20 patent examiners in 2006 and 19 more recently. At present, we have 72 patent examiners but in terms of experience, it is quite a challenge. The total experience per individual averages out to only 5.25 years and it takes two years for them to be fully on their own. We turn to our international counterparts for help in terms of training, but we need to really fast-track our people in this area," says Kamel. In a bid to follow in the footsteps of Stanford University, Silicon Valley's talent mill, MyIPO has signed memorandums of understanding with several local universities to provide advice to help them set up technology licensing offices within the campuses. The big difference here is that IP registration can be done within Stanford grounds, but these technology licensing offices will not provide this service. Asked if MyIPO is looking into setting up branches in leading research universities, Kamel says there are no plans to do so yet. I was away to attend a Training on Patent Protection for Computer Software (May 5-12). The event was organized by MyIPO and JICA (Japan International Cooperation Agency). The speaker is Hideyo Sato, a patent attorney and lecturer of Nihon University. Halve of the attendees are MyIPO patent examiners. Japan is one of the industrialized country which actively develop their own patent law. Today they have a one and only unique patent law which rest on part of their constitution. Japan have their own interpretation on the laws of nature. Matters that doesn't need human intervention are considered to be law of nature. The training covers the development of software industry and patent laws with regards to software. They actively develop their own software. It is natural that Japan wants to optimize protection for their home grown software. Examples of software patents, including business method in software was introduced. In Japan, business method is worded as part of a software invention incorporated in a hardware to automate information processing. Everyone enjoyed the training and it was a good networking session. The training is an eye opener for me to learn Japan's perspective on patent laws. Universiti Putra Malaysia (UPM) bagged the National IP Award 2008 in the individual category and organization category. The proud individual winner of UPM is researcher Prof Madya Dr Raja Noor Zaliha in her work on Lipase 205y. Lipase 205y is an organic solvent tolerant lipase from Bacillus sphaericus 205y. It has specific cleansing properties which makes it attractive to be used in soaps, cosmetics or pharmaceutical products. The award was conferred by MyIPO and Domestic Trade Ministry in conjunction with "Hari Harta Intelek Negara" or National IP Day in conjunction with World IP Day. An expo was held in KLCC from 24th to 27th April. I was advised by patent attorneys in China to file for a patent and a utility model for national phase filing. Utility model is not examined in China. Hence, a certificate for utility model may be obtained within one year from the date of filling. The certificate is valuable for enforcing IP rights in China. Their town council have enforcement rights to raid factories. Hence, factories manufacturing license are at the mercy of town councils. The utility model may be withdrawn to make way for a granted patent. It takes three years to get a patent granted in China. BANGI: Two Universiti Putra Malaysia researchers whose inventions have brought in more than RM20mil have won the Commercialisation Award at the university’s excellence awards ceremony. Assoc Prof Dr Syed Omar Syed Rastan and Assoc Prof Dr Ahmad Husni Mohd Hanif’s agro-based products Vita-Grow and Zappa were devised specifically to increase padi yield. With the use of the products, padi farmers’ yields have increased from four tonnes to 10 tonnes per hectare. Vita-Grow and Zappa are also being sold in other Asean countries and the Middle East. The scientists from the Agriculture Faculty received their awards from Higher Education Minister Datuk Seri Mohd Khaled Nordin at a ceremony here on Wednesday night. “We wanted to tackle the problem of weedy rice which affected padi growth as well as increase nutrients for padi growth,” said Syed Omar. Well done: Ahmad Husni (left) and Syed Omar (centre) being congratulated by Khaled after winning the Commercialisation Award at UPM’s excellence awards ceremony on Wednesday night. In his speech, Khaled said Malaysia only commercialised 3.5% of its research findings compared to 10% overseas, adding that efforts to do so would be intensified. “Malaysia currently spends 1.5% of its GDP on research and development activities. “We have the Science Fund and Techno Funds with an allocation of RM1.2bil and RM1.5bil respectively and have doubled the Fundamental Research Grant Scheme from RM100mil to RM200mil,” he said. Khaled also congratulated UPM for receiving the highest allocation under the Fundamental Research Grant Scheme among the public universities. Dr Cheah Yoke Kqueen and Dr Zulhamri Abdullah who were given the Young Researchers Award. Research and innovation is under science minister portfolio. Our new science, technology and innovation minister is Maximus Ongkili. Maximus holds a PhD in Agricultural Economics from La Trobe University, Australia. He was a lecturer in UPM. He entered politics by joining Parti Bersatu Sabah. Previously he was appointed as a Minister in the Prime Minister's Department with a specific role in promoting National Unity and Integration. He is humble with down to earth image. IP is under domestic trade minister portfolio in Malaysia. Shahrir Samad is sworn in as our new domestic trade minister. He holds a bachelors degree in statistics and an MBA. Before the elections, he was the chairman of Barisan Nasional Backbenchers Club (BNBBC) and Publics Account Committee (PAC). He resigned from BNBBC in 2006 because he couldn't get support from other BNBBC members to support a motion to query a 'close one eye' incident at Melaka customs. 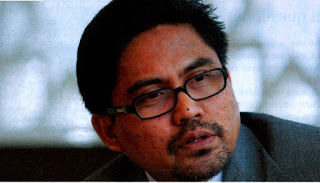 When he was PAC chairman he was tasked to investigate the Port Klang Free Trade Zone scandal. Viewed as a person with high integrity, his appointment as domestic trade minister shows the seriousness of the government in healing local economies. Domestic trade ministry is one of the toughest and most criticized ministry. Bread and butter issue is one of the main concern voiced by voters. He maintain a blog in Bahasa Malaysia. Malaysia experienced an increase in PCT applications from 60 applications in 2006 to 103 applications in 2007 according to WIPO. The applications refer to Malaysia residents or organizations who filed PCT phase 1 applications in Malaysia. Malaysians have increased awareness in patent filing by being a member of PCT since August 2006. However, the number of applications are far from any of the top three patent filers. USA lead the pack with 52,000 applications. Next is Japan halve away with 28,000 applications. The third place goes to Germany with 18,000 applications. There are 156,000 filings for PCT in 2007. The statistic noted increased filings in East Asia particularly Korea (7,000 at 4th place) and China (5,400 at 7th place). Malaysia's neighbor, Singapore has 542 applications to become the top filer in South East Asia. Malaysia's population is more than five times the size of Singapore. However, Singapore has more than five times PCT filings than Malaysia. Malaysia is second in South East Asia. The top three PCT applicants with published patents are Matsushita (2100), Phillips (2041) and Siemens (1,644). Huawei of China is 4th with 1365 applications published. Each top 50 applicants have more than 200 published patents. The top three fields of PCT applications published in 2007 are telecommunications (10.5%), information technology (10.1%) and pharmaceuticals (9.3%) sectors. To Choose a Word mark or Logo? For business owners who are on a budget. What if you have to choose between applying a trademark for a word mark or logo? - Prevent similar mark that sounds alike. eg. Sony can prevent Suny in the market. - Can be used for any logo. eg. Coca-cola logo has evolved over 100 years but the Coca-cola word remains as the brand. - Protection is limited to the appearance of logo. Can't be used for evolution of new logo. Hence new logo are treated as separate and new mark. 1) Microsoft comes from the word MICROcomputer SOFTware. The mark is distinctive. 2) HP comes from the founding partners of Hewlett and Packard. Foreigners have more confidence in conducting business in Malaysia when 13,605 foreign trademark applications are received last year compared to 12,840 foreign trademark applications from the previous year. MyIPO director, Kamel Mohamad said, the applications are mainly from first world countries such as USA, Japan and Europe. "During the same period, 17,382 foreign trademarks are registered compared with 10,108 from the previous year." "The uprising trend shows that many foreign firms have intention to invest or commercialize their product in our country, " he said when meeting Utusan Malaysia today. According to him, 8,108 local trademark are registered compared with 5,651 from the previous year. When asked about patent applications, Kamel said, ninety percent of applications received are from foreign countries. He mentioned that a lack of exposure among businessman, inventors and researchers contributed to this situation. Translated from Utusan Malaysia, Feb 18. Imagine if you can use your hand phone to make free calls... but there's a catch. You shall agree to receive sms advertisement. All you need to do is to send a request for sms advertisement of a topic of your choice, such as hypermarket, IT or movie. Then you will receive a related sms advertisement with a free talk time. Hence, you can then make free calls because your calls are paid by the advertiser. Any takers? This plan is created by my client who filed a patent for this plan. Went to Digi's headquarters on Jan 9 to listen to how Digi transformed itself into an innovative company. Morten Lundal, CEO of Digi explained how he changed a typical corporate culture (dominated by old ranks and organization practiced by most organizations)into a new innovative company which embraces creativity, efficiancy and innovation. The staffs are working in a paperless environment with no permanent seats. They have a one and only unique staff welfare scheme irregardless of the rank of the staff. The 'Happy' product was also introduced to the crowd organized by MACRI. Now I understand why Digi won the best workplace practice and culture for Malaysia's CSR from PM in 2007.